Comedy Bang! Bang! is the definition of a show where the synopsis barely scratches the surface of what an episode is actualy going to be like. 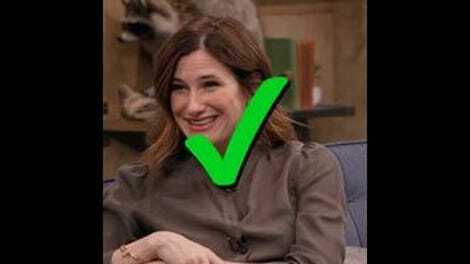 Take, for example, this week’s episode synopsis: “Kathryn Hahn stops by and swears like a sailor. John Lennon comes back from the dead and Scott teaches the skills you need to host a talk show.” All of that is very true. In fact, that description really is enough to sell this episode of Comedy Bang! Bang! in advance. But it’s a very way to describe an episode with this one’s entire premise and framing device. If “Lizzy Caplan Wears All Black and Powder Blue Espadrilles” is the greatest example of Comedy Bang! Bang! absolutely knowing a framing device and hitting every mark within it perfectly, then “Kathryn Hahn Wears Ripped Jeans and Black Heels” is the equally impressive (or possibly even more impressive) sequel to that. The former nailed how inconsequential and cloying those countdown shows can be, even including some genuine disdain from Scott during the entire event. But here, it isn’t a biting commentary on the concept it’s mocking—it’s simply an honest (albeit absurd) portrayal of the type of disinterest that educational videos from the ‘80s and early-to-mid ‘90s could bring, despite their flashiness. Every act break where Scott yawns, coughs, or looks for something to do makes that perfectly clear. In theory, this episode’s focus on an educational video (with a twist!) isn’t as lofty as a time travel adventure or a topsy-turvy conundrum or a clash of the titans. But it’s certainly more fully-formed than all of those combined, and that’s what makes it a winner. Well, that and the combination of every guest and character involved. From the very moment the episode begins with “tracking,” right into the ‘80s PBS-meets-”How To” video style and format, it’s obvious that this episode is going to be a winner; after all, there’s the disclaimer that this is for “educational purposes only,” with each lesson supposedly being “the most important part of being a talk show host.” Everything about “How To Host” has the details to be a pitch perfect parody down, from the dumb acronyms for almost everything to the cheesy, “hip” music video to the trivia facts to the wipes and fades from someone who just learned how to do wipes and fades (which also makes sense given the pay-off to the framing device). Be constantly continuing to connect! This is a rich episode with instant rewatchability, one where you honestly might not catch everything on first viewing. In fact, my notes are probably longer than review simply because of how much content in this episode. (Since I can’t do it organically, here’s where I mention “Bey-ASAP” and the “Profit Yearly” bar graph.) I can remember watching plenty of PBS as a kid and seeing some wonderfully lame educational videos in elementary and middle school (and this episode leaves the door open for a future D.A.R.E.-type episode), and all of them are pretty much like “How To Host.” Jimmy Fallon, who mastered the art of the late night show, actually used to do a recurring bit on Late Night with an ‘80s dating service that was similar, but that was obviously a smaller, broader concept. 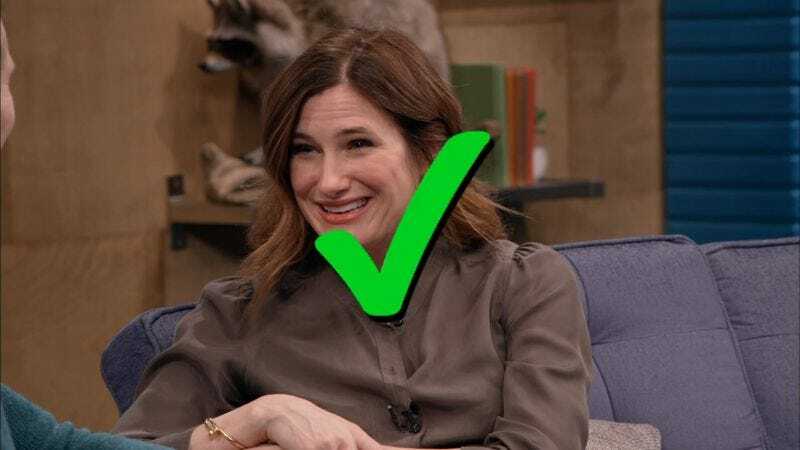 Stretching the concept to longer than three minutes is the true test of whether such a thing has legs, and “Kathryn Hahn Wears Ripped Jeans and Black Heels” proves that in 20-plus minutes. Speaking of Hahn, she’s as great of a guest as expected and one who the episode makes sure not to squander in service of the “How To Host” part of the episode. In fact, given how elaborate the episode’s framing device is, there’s really no expectation that Kathryn Hahn will even be a part of that side of things. So when she materializes in pixels into this VHS world, the episode continues to ascend in a way that didn’t previously seem possible. That’s the key to this episode: It’s one big rise without any slips or falls on the way to the end, and the framing device doesn’t overpower the rest of the episode. Comedy Bang! Bang! has been a bit uneven this season when it comes to that and having strong endings, but it’s not even a factor here. There’s a rhythm to Comedy Bang! Bang! guest spots for the most part, but in Hahn’s case, she very much has to work in service of the lessons in “How To Host.” That allows her to be all over the place in a “logical” way, free to steal money from Scott (and witness Scott go all Godfather on Eric) and then reveal domestic abuse in a cheery and upbeat way. Hahn makes it all look easy, even when she has an Uzo Aduba spotlight moment and sings her abbreviated version of “Itsy Bitsy Spider.” The choice to cast her in this specific episode is just another one of the great choices Scott Aukerman and company makes here. By the way, we miss you, Reggie. Last, but certainly not least, is Mike Hanford’s appearance as his recurring Comedy Bang! Bang! the podcast character, John Lennon. Yes, the John Lennon. It’s a very condensed version of the character from the podcast, but it certainly hits all of the required beats. The John Lennon character is one of the ultimate examples of “yes-and” being key to the performance, as so much about the John Lennon character makes zero sense if anyone really presses forward with their questions about him. Like the dead for four years aspect of the character, which is explained away by sheer force of will, or his forgetting to contact Yoko. One thing no one needs to question, however, is his love for Ringo, his best friend in the whole world. It’s certainly a surreal character, and the onscreen version looks more like Barry Gibb, but a major part of what sells it in this depiction is Kathryn Hahn and Cudi’s excitement over the fact that John Lennon is in the building. Because it’s John freaking Lennon. Scott, on the other hand, would probably more excited if it were one of the other lovable lads from Liverpool. Then there’s the ending, which is a classic Comedy Bang! Bang! twist. The “How To Host” video is great without further context, but it’s even better once it turns out to be Scott’s video will. Then, who Scott gives his “Comedy Bang! Bang! franchise” to is what really nails it. You can see that Cudi expects it to be him, but instead, it ends up going to Scott’s actual, non-Reggie Watts best friend: Slow Joey. Scott’s constant faith in Slow Joey is really an unexpected delight of this half of the season, especially as it is bizarrely one of the rare bits of continuity on this show. The combination of that and video Scott saying that he will be in heaven with his dead wife Mavis (R.I.P.) is really the perfect way to end this season. Just pretend there’s not a Christmas episode next week. Scott’s Onscreen Credit: There’s a fake-out at first, with the standard Scott Aukerman during the “How To Host” video. But then we get the real onscreen credit: Ska Checkeredvans. It’s the ‘90s! I feel like it’s playing up the “how to” aspect of this all, but I definitely saw Cudi as more of a stereotypical band leader in this episode. Unless he really found every thing Scott was saying so hilarious he had to laugh out loud. Of course, Comedy Bang! Bang!’s sense of time and space remains an absolute mystery, as Slow Joey’s tombstone has him dying in 2072, and this video from 1995 has contemporary references. “A host without a band leader is like Batman without Robin. Rory without Lorelai. Or Jake without Amir.” I appreciate a good Gilmore Girls reference (especially since I’ve been bingeing Gilmore Guys podcast), but I applaud an out-of-nowhere Jake & Amir reference.